Modern readers might conclude that Kirk, as an educated man, would not have observed the same customs and taboos of his parishioners and therefore did not regard the crossing of a fairy threshold in the same manner. This may well be the case. However, Kirk’s writings suggest a more complex picture, of a man searching for evidence of the spiritual realms within the folk traditions of his countrymen and women while simultaneously navigating theological doctrine and, as will be seen, contemporary ideas about science and natural philosophy. 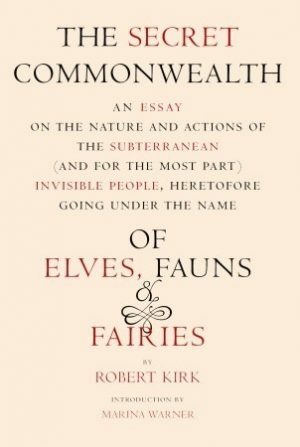 There are many aspects of this remarkable text worth exploring, but for the purposes of this discussion, focus is directed towards his engagement with the natural world and his treatment of the fairies as simply another species inhabiting this planet. Throughout Kirk’s dialogue the natural and supernatural worlds intermesh and are, at times, indistinguishable from one another. The concept of liminal space, of visible and invisible boundaries that demarcate the junctures between the natural and supernatural worlds, is also a notion that surreptitiously permeates Kirk’s treatise. Furthermore, Kirk draws on his understanding of the lives and habits of a variety of animals and the workings of the natural world to inform his interpretations and explanations about the operations of the supernatural realms. All of existence, in its entirety, Kirk described as consisting of seven major spheres: Heaven was situated along the circumference of the earth. Living in the highest region of the air was the ‘Manucodiata’, an old name for a Bird of Paradise; followed by common birds; then flies and insects at the lowest region. On the earth’s surface there were humans and beasts; under the surface of the earth and water were worms, otters, badgers, and fishes. At the centre of the earth was Hell.7 Under such a system it was inconceivable to Kirk that the ‘midle caveties’ of the Earth could be empty. Robert Kirk thrived at the dawn of the Scottish Enlightenment and arguably his ways of seeing and interpreting the natural and supernatural world demonstrate that the empirical impetus of the age did not merely supplant or replace spiritual or Neo-Platonist beliefs but entered into a process of mutual negotiation and exchange.15 Utilizing knowledge drawn from oral tradition and using the combined skills of folklore, theology, and natural history, Kirk’s text stands as a fascinating insight into seventeenth-century folk and learned ideas about both real and imagined liminal worlds. Patrick Graham, Sketches of Perthshire (1806; London, 1812) pp. 253-55; Lizanne Henderson and Edward J. Cowan, Scottish Fairy Belief: A History (2001; Edinburgh: John Donald, 2007) chapter 6. It underwent subsequent reprinting and fresh transcriptions in 1893, 1933, 1964, 1976 and 2001. Michael Hunter, The Occult Laboratory: Magic, Science and Second Sight in Late Seventeenth-Century Scotland (Woodbridge: The Boydell Press, 2001) pp. 20-21. Hunter, Occult Laboratory, pp. 81, 85, 89. Hunter, Occult Laboratory, p. 77; Stewart Sanderson, ed. The Secret Common-Wealth (Cambridge: D. S. Brewer, 1976) pp. 38-9. Hunter, Occult Laboratory, pp. 79, 82. See, for example, Lesley Robertson, et.al., Antoni van Leeuwenhoek: Master of the Miniscule (Leiden: Brill, 2016). Hunter, Occult Laboratory, p. 99. Hunter, Occult Laboratory, pp. 114, 79. Lizanne Henderson, ‘Tündérek, angyalok és a holtak földje: Robert Kirk Lychnobious People címú múve’, in Test, Lélek, Szellemek és Természetfeletti Kommunikáció, Szerkesztette Éva Pócs (Budapest: Balassi Kiadó, 2015) 368-85; Hunter, Occult Laboratory, pp. 96, 79, 88. Hunter, Occult Laboratory, p. 87. Hunter, Occult Laboratory, pp. 79, 112; The much celebrated colour changing abilities of the chameleon are, in fact, greatly affected by climate and the general health of the animal, while the alternation of shades is mostly restricted to green or bluish grey to pale yellow tones, with some patches of dull red. The chameleon eats insects but can abstain from feeding for a considerable time, hence the once popular notion that it was nourished by air alone. Hunter, Occult Laboratory, pp. 80, 82. Hunter, Occult Laboratory, pp. 79, 89. Hunter, Occult Laboratory, pp. 96, 102, 100. On the interface between Enlightenment ideals and folk belief see also Lizanne Henderson, Witchcraft and Folk Belief in the Age of Enlightenment: Scotland, 1670-1740(Basingstoke: Palgrave Macmillan, 2016).